TonyBet announced their second Online Open Face Chinese (OFC) Poker Series starts this April. 17 events will be running from 26th April – 3rd May, with more than €30,000 guaranteed. 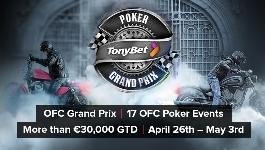 Apart from the OFC Poker Series, Tonybet will be running a number of promotions, including cash games and tournament leaderboards, to reward players with free tickets to OFC Grand Prix events, cash prizes, and packages to the next live OFC Poker World Championship. Check out the OFC tournament schedule here for more details.